I've been told this is a "fern leaf peony" by the previous owners of the house. Their mother had planted it back in the '50s and, when she moved they tried to dig it up and take it to one of the kids' house. When we moved in in 1989 it was just a sprig. I could tell it was a peony and so I left it alone and let it grow. And grow it did! It is the first to bloom every spring and it's quite the show-stopper. I have tried looking up "fern leaf peony" in the books I have, but can find no reference for it. However, a quick Google search on the name brought up a lot of information. According to most of what I read, this is probably not a true tenuifolia because the leaves are not completely "feathery". "18. 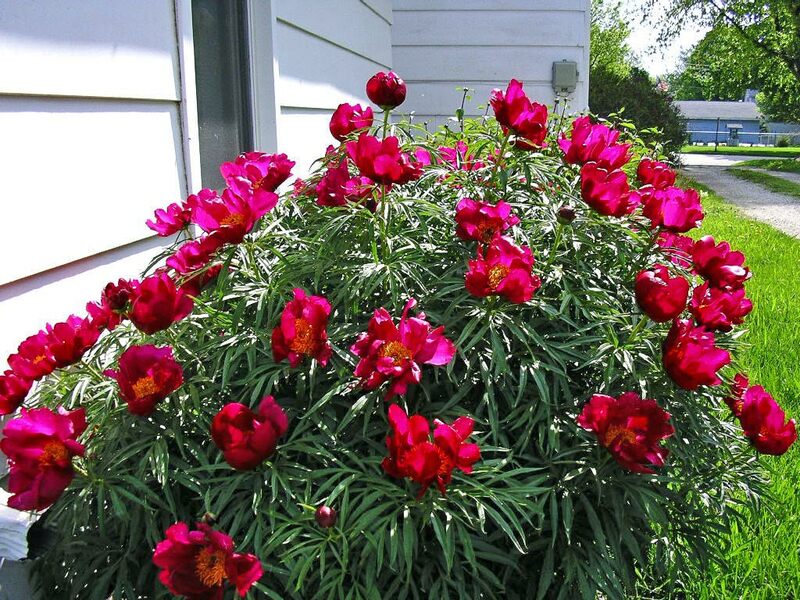 What is the "fern leaf" peony? Paeonia tenuifolia and its varieties. The term "fern leaf" peony is often used to describe a specific species of herbaceous peony namely Paeonia tenuifolia. This species has very distinct soft almost needle like foliage with single red flowers. 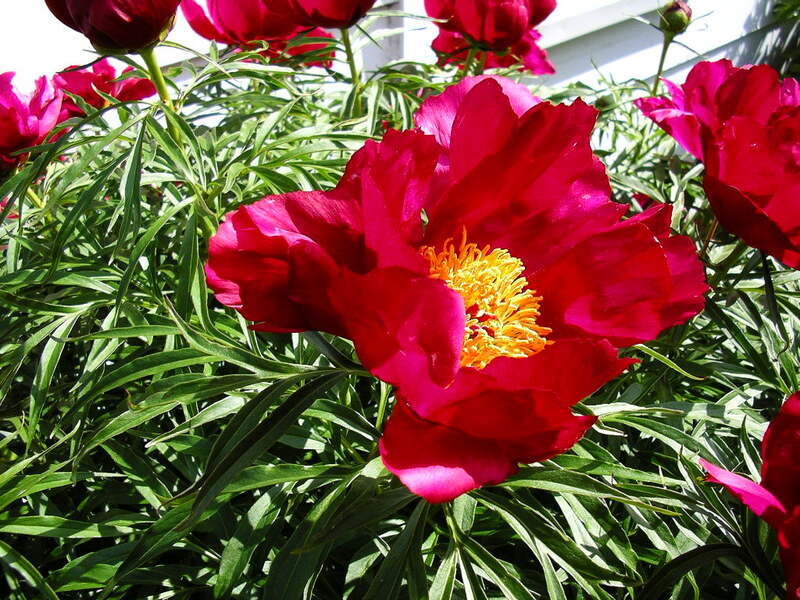 The most popular "fern leaf" peony however is the double flowered variety P. tenuifolia 'Rubra Plena'. P. tenuifolia flowers very early in the peony season and is a good choice for the rock garden or the front of the border because of its diminutive stature - 40 cm (16 in) or less. 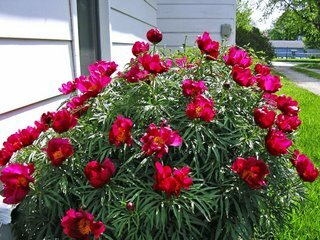 A disadvantage of these peonies is that the foliage tends to go dormant and die back earlier in the season than the more well-known lactiflora peonies." Whatever the name, I'm certainly glad this beauty did not die. We have pink peonies in the yard and it's always such a pleasure to watch them bloom. Hi Ivonne - Isn't it though? I'm so glad it survived. There is a peony planted on my family's grave site that I want to transplant. It's the deepest red I've ever seen. I keep saying I'm going to do that this fall... for like the last ten years! Some day. I love peony bushes. Too bad they don't last longer.